Approach the financing process the same as you would approach dating. There are things you can do that improve your chances of success. You, as a business owner, can go a long way toward impressing a lender, which, in turn, can go a long way in establishing a loan for your business growth. What follows is a list of preparations to make prior to seeking a small business loan. We get it. No one likes to be told no. However, the more you shop for a loan the more you’ll realize there are differences in lenders. Banks vary greatly in terms of the industries they’re familiar with, the concentrations of loans they already have on their books and the size of businesses they are willing to work with. Therefore a “no” isn’t always personal. It could be based on specific controls imposed on the lender that have nothing to do with the quality of your loan. Expect to be told no at least once before getting a business loan. Yes it’s tough, but be persistent. You know your business inside and out. The lender doesn’t. Are you ready to summarize your business, its market, competitors and the reason you’re requesting financing? Are you ready to articulate how you’re going to use the capital, how you’re going to repay the loan and what impact the loan will have on your business? Lenders don’t expect you to be a financing expert. They just want to know that you’ve thought about why you need the loan, how much you need, how you’ll pay it back, what you’ll do in the event you can’t pay it back and why they should trust you. Let’s think about the dating scenario again. Which date would you enjoy more: someone who told great stories, smiled, had a sparkle in their eye and spoke with excitement about their life or someone who looked down at the table and all but apologized for wasting your time? Sitting in a lenders office is no different. You are the face of your business. Be proud, be excited, know it through and through and let passion shine through when you speak. Some business owners assume their personal credit scores won’t make an impact when it comes to obtaining financing for their business. However, while business credit scores and personal credit scores are technically two separate things…they’re often not seen that way, because, in some respects, you are your business. We’ve just told you to have passion, and it’s absolutely necessary. However, your great plans must be realistic. Can you provide facts to support why your business is the best and why it will grow tenfold in the next year? As passionate as you are, you can’t overestimate the revenue you expect to get. Have some realistic financial projections available and a plan for growing your business in manageable stages. This one is pretty basic. Borrowing money is serious business. Lenders require that business owners have an organized, detailed and quantitative plan. Organized is the key word here. Do you have all your past records and documentation – tax returns, legal documents, etc. – readily available? Collateral. Capital. Good Credit. To secure a business loan, the lender needs to be convinced of your ability to repay the loan. What type of collateral will you provide as a form of security for the cash being borrowed? Collateral can be property, equipment, stock or other assets and serves as protection against a possible default. Regarding capital, lenders like to know you have some skin in the game. They will compare the amount of money you’re asking to borrow with how much cash is already in the business, or with how much cash you’re planning to contribute. If you invest a lot of your own money it gives the lender confidence that you are just as committed to the success of the business as you’re asking them to be. Good credit could almost be a topic of its own. Some business owners assume their personal credit scores won’t make an impact when it comes to obtaining financing for their business. However, while business credit scores and personal credit scores are technically two separate things…they’re often not seen that way, because, in some respects, you are your business. Any hardships you go through personally MAY impact your business and vice versa. Your personal credit score is also seen as a direct reflection of how responsible you are with money and how dependable you are as a borrower. This becomes especially important when you are a new business owner because the only record of creditworthiness lenders have for making a loan decision will be your personal credit score. You are the face of your business. 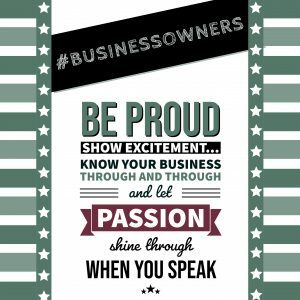 Be proud, be excited, know it through and through and let passion shine through when you speak. Loan Information: the requested loan amount, use of proceeds, terms requested, collateral available, equity contribution, etc. Business Description: history of the business, description of the products/services, location, market description, competitors, marketing strategies, demographics, future plans, etc. Financial Information: three years of tax returns, schedule of debts, income statement and balance sheet, personal financial statement, projections, etc. Other Supporting Documents: legal documents, quotes or estimates for any items to be paid for with loan funds, franchise agreement if applicable, etc. If you take one thing away, it should be this: lenders don’t expect you to be a financial expert. They do, however, expect you to be prepared and to articulately speak on behalf of your business. Your passion, preparedness and integrity will go a long way toward impressing a lender. Contact Growth Corp’s Lending Team to see if you would qualify for SBA 504 Financing.